Hip Surgery: Hip Replacement Surgery | Jay Kruse, M.D. 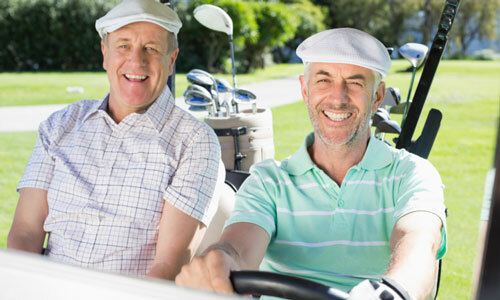 Hip pain can be very debilitating, keeping patients from enjoying their favorite everyday activities, such as running or golfing. The most common causes of hip pain are osteoarthritis and rheumatoid arthritis. Osteoarthritis is a progressive joint disease affecting more than 40 million Americans. It causes the cartilage that cushions the joints to decrease, exposing the bones to increased friction. Rheumatoid arthritis is an autoimmune disease that causes chronic inflammation, which often results in a decrease in the protective cartilage. Rheumatoid arthritis can affect patients of any age, but women have a higher risk of developing the disease than men. During the early stages of arthritis, many patients are able to control symptoms and slow the progression of the disease with pain medications, rest, and physical therapy. Before starting a treatment regimen, it is important to make an appointment with an orthopaedic surgeon to determine the exact cause of pain. As arthritis progresses it will often result in extensive bone damage and typically will require surgery to correct. Dr. Kruse will often recommend total hip replacement surgery to patients suffering from severe osteoarthritis and rheumatoid arthritis, who are unable to relieve pain symptoms with more conservative treatments, or who have a minimal range of motion. During the total hip replacement surgery, Dr. Kruse will use minimally invasive techniques to remove and replace the damaged bone and cartilage on both the ball and socket of the hip joint with prosthetic implant. The prosthesis is composed of both metal and plastic, and is designed to replicate the natural movement of the hip joint. Dr. Kruse has fully embraced minimally invasive surgery. Recent innovations in hip replacement surgery allow for much quicker recoveries than the surgeries of the past. Most typically patients bear full weight the day of surgery. Furthermore, advancements have provided for much less post-operative pain and quicker return of normal function including work and sports. Specializing in total joint replacement, Dr. Jay Kruse is committed to excellence by pledging to provide the highest quality of orthopedic care possible. Using the most innovative, cutting-edge technology, Dr. Kruse provides the most current treatments available for hip pain. To make an appointment with Dr. Kruse please call our Minnesota office at (763) 786-9543.